Situated on the outskirts of Killin, Otter's Holt is within an hour and a half from Glasgow and Edinburgh and has a fabulous setting on the River Lochay. 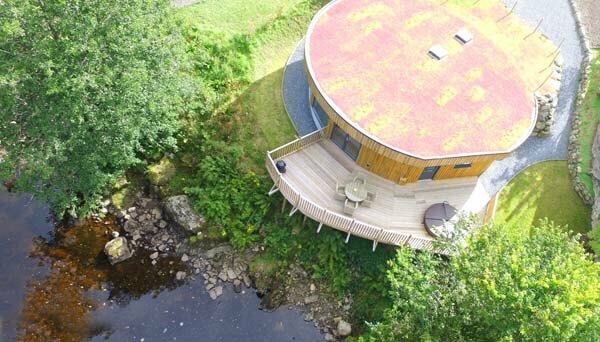 The timber clad property is characterised by its circular shape, grass flat roof and floor to ceiling glass windows from where guests can enjoy the lovely river and if lucky, spot an otter! The area is rich in history, wildlife, activities and attractions, with water sports, hill walking, mountain biking, fishing, golf courses, castles and distilleries on the doorstep. Killin is a charming small village at the western end of Loch Tay, in the heart of highland Perthshire. There are interesting shops and a variety of great places to eat withing walking distance - perfect if you don't want to cook all the time! The village inn is within seconds from the property - discounted food for guests and first class take away meals and afternoon teas! At the edge of the Ben Lawers National Nature Reserve and the Loch Lomond and Trossachs National Park, this is an ideal location for lovers of nature and the outdoors. Otter's Holt comes with a private hot tub embedded into the decking overhanging the river - perfect for relaxing after a day out! Otter's Holt has two luxuriously appointed bedrooms - the king sized one has an ensuite bathroom and the twin and ensuite shower room. The spacious open plan living, dining and kitchen area offers all the modern conveniences, and guests can relax here enjoying the views at the end of the day exploring. The limestone flagstones in the kitchen and living floor areas are very cosy underfoot with the warmth of the underfloor heating! From Glasgow or Edinburgh, go towards Stirling, heading for Junction 10 on the M9. At Junction 10, take the A84 through Callander towards Crianlarich. At Lochearnhead the road changes to the A85. Follow this road until the A827 to Killin and the cottage is located on the outskirts of the village, close to the Bridge of Lochay Hotel. Egyptian cotton bed sheets, bath sheets, hand towels and bath mats supplied. Luxury hand soap, herb and spice cupboard, eco friendly dish washer tablets and washing up liquid are provided. Otter's Holt is rented out throughout the year. To book this gorgeous self catering property with a hot tub, click the enquiry button below and see availability and prices. This is a stunning holiday cottage in an amazing setting overlooking a river. This cottage with a hot tub is an fascinating circular design with full length windows and a grass roof. 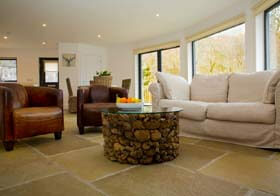 It is beautifully appointed and every need has been thought of - ideal for a relaxing break.